Today at 19:28:24 UT, it is exactly 60 years ago that Sputnik 1, the first artificial satellite of the Earth, was launched from Tyuratam (Baikonur) in the Soviet Union. Thus, the Space Age was born. Sputnik 1 would stay in orbit for four months and then re-entered into the atmosphere. 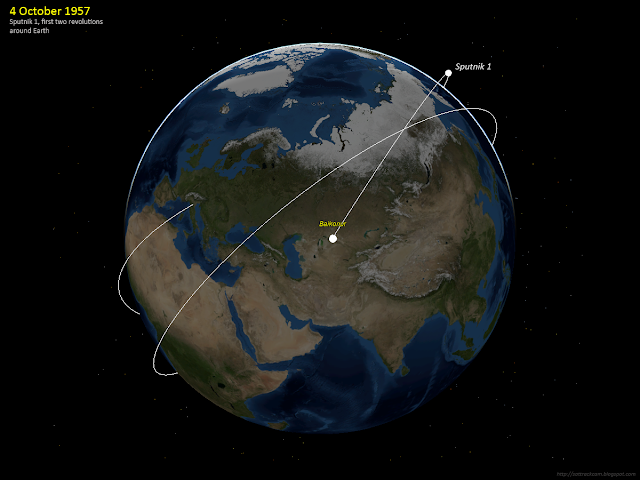 The image above shows the very first two orbits (and is based on a TLE from the website of Jonathan McDowell. Strictly speaking, this TLE is for the upper stage of the rocket, but during the first few orbits the orbits of both objects were very similar). Over the past months, I have spent a number of posts on North Korea's recent increasingly bold missile tests. 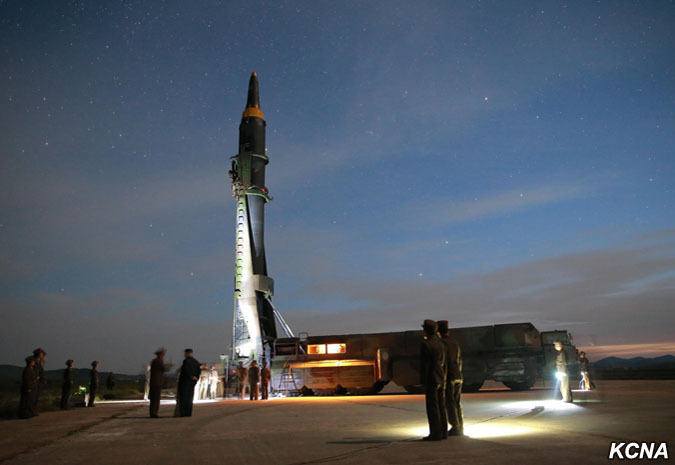 The latest of these tests happened on September 14 (local September 15 in North Korea). At 21:57 UT that day, North Korea launched a Hwasong-12 IRBM from Pyongyang Sunan airfield towards the east-northeast. 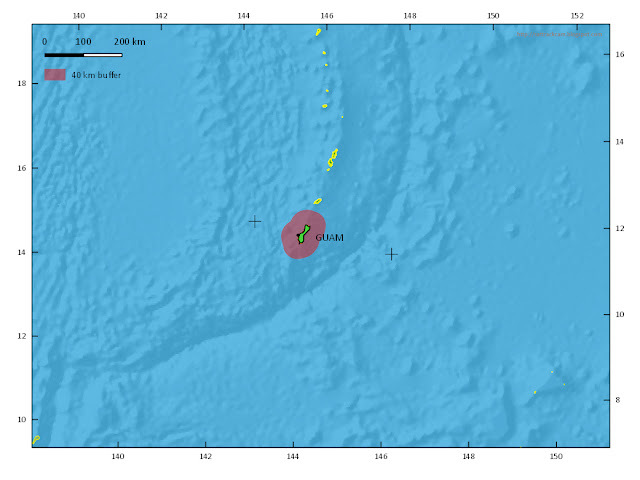 It crossed over Japan (causing air-raid alarms to go off) with, according to western military sources, a range of ~3700 km and apogee at 770 km, before impacting in the Pacific Ocean. The test was the second one to launch the Hwasong in a 'regular' rather than 'lofted' trajectory, over Japan. I was abroad at the time of the test, meaning it was several days before I could look at this test and start an analysis. Some results were earlier presented on 23 September as a Twitter-thread. The result of this georefencing is that the drawn trajectory starting at Sunan ends at approximately 39.60 N, 168.05 E. The range from Sunan to this impact location is 3615 km. Note that I have added, in yellow, country outlines to the map to show the validity of the georeferencing. I also added a few annotations. 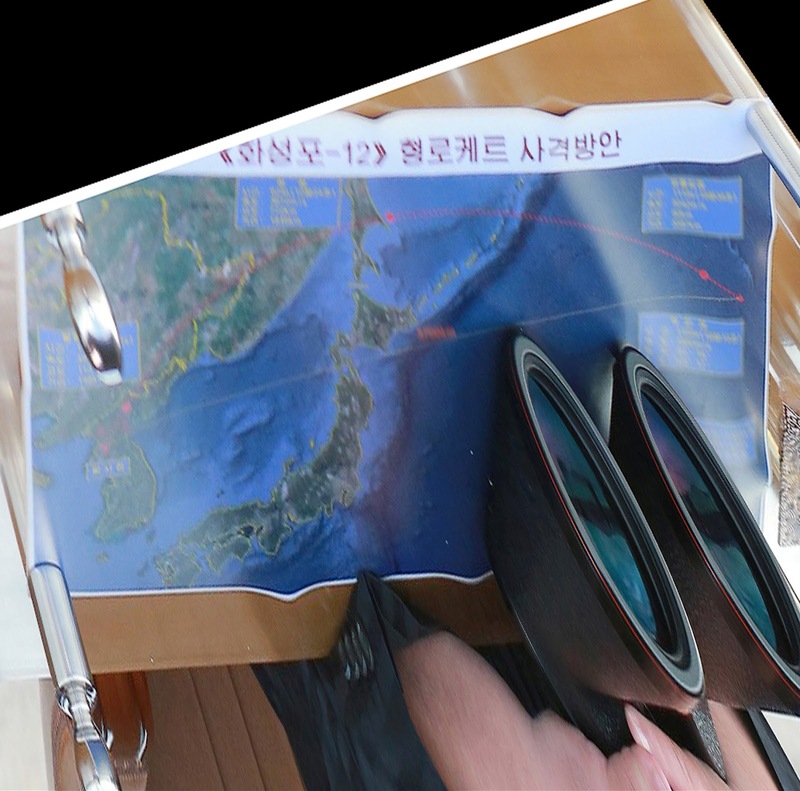 I have added an STK-modelled ballistic trajectory to the map as a dashed red line: it is highly similar to the original trajectory line drawn on the map, as you can see, with apogee position corresponding to what appears to be a text in red on the map: what was depicted on Kim Jong Un's map hence appears to be a real ballistic trajectory. 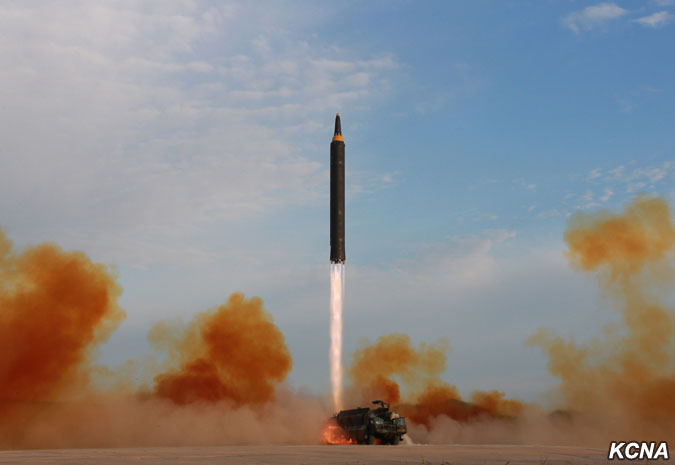 The resulting range of 3615 km is close enough to the range reported by Western military sources (about 3700 km) to conclude that the 14 September test went much as intended. This is a difference with the 29 August test. 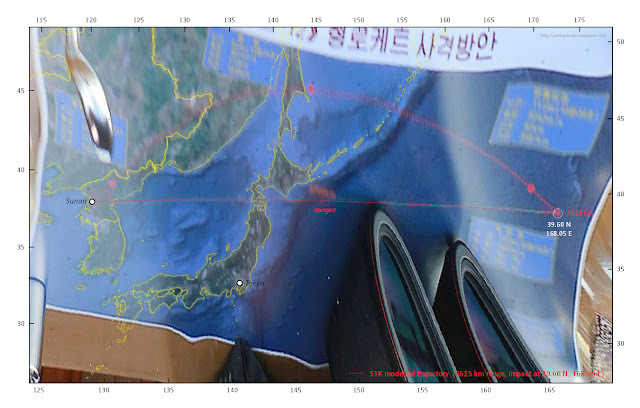 In that case, the map showed a ~3300 km range while western military sources said the actual range flown was ~2700 km: it also flew more north than the trajectory that was depicted on the 29 August map. See my earlier blog post here. The match for the 14 September test might indicate that the 29 August test perhaps did not go as intended. It is interesting to look at the range distances for both tests. The range distances of 3316 km and 3615 km ring a bell. 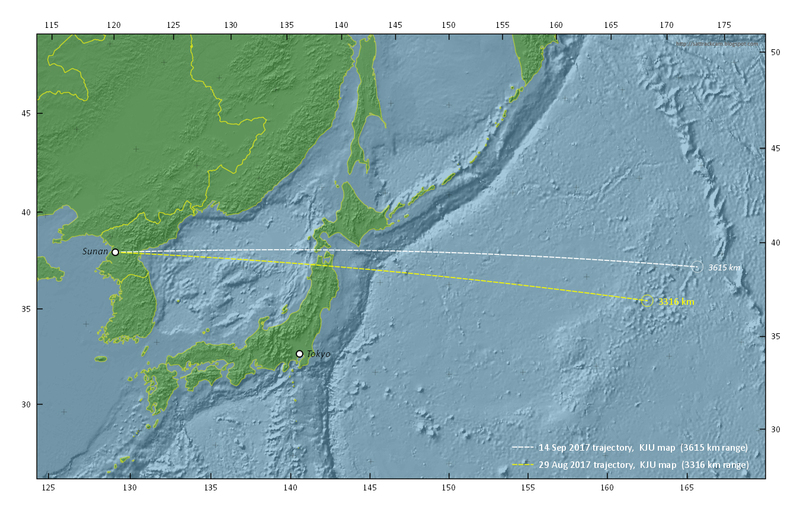 The distance from Pyongyang Sunan (the launch location) to Henderson AFB on Guam is ~3415 km. The August 29 map trajectory falls almost exactly 100 km short of that range, while the September 14 trajectory almost exactly 200 km overshoots this range. I am going back-and-forth on whether this is significant or not. I tend to think that all these kind of map images released are intentional propaganda meant to convey a message: the map is meant to be analysed and "read" by the West. 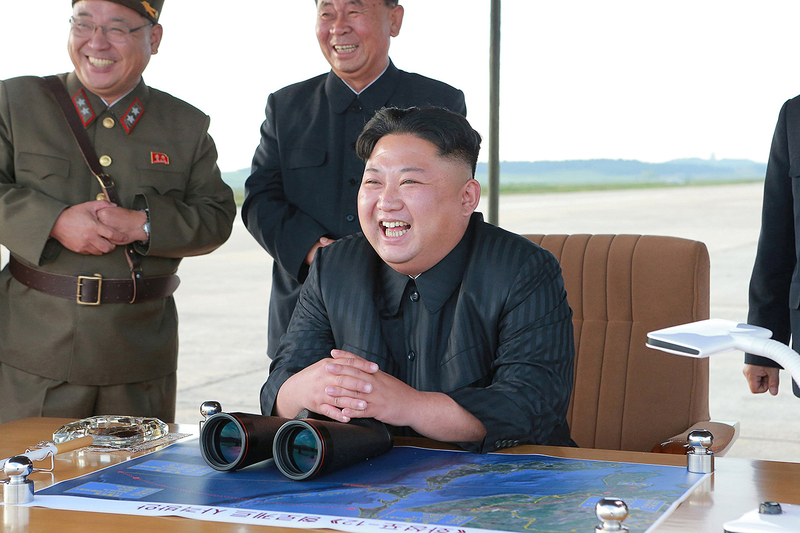 Remember that North Korea has "threathened" to conduct a quadruple demonstration with four missiles impacting in international waters in an 'envelope' around Guam, if the Trump administration does not stop B1 bomber demonstration flights from Guam. Do we see some kind of test mock enactment for this here? Is the message: "We are already practising for this, imperialist barking dottard dog!". 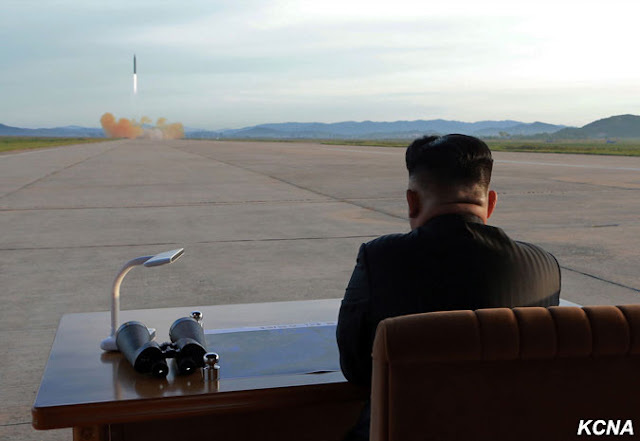 It would become very interesting if North Korea were to launche two other missiles the coming month, and the pattern where they (were implied to) land relative to the earlier two tests might be very interesting.